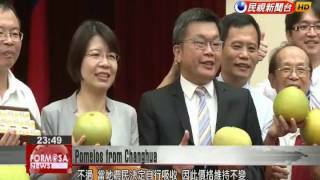 Late autumn is harvest time for the special “Xishi” pomelo grown in Changhua County, and farmers from the area were busy hawking the citrus at the Legislature today. A cold snap at the beginning of the year, combined with damage from Typhoon Megi last month, conspired to cut this year’s harvest by between 30 to 40 percent on years past. But growers are keeping prices stable, having decided to absorb the costs themselves. Miaoli County’s Yuanli Township is home to a new piece of rice paddy art that’s attracting visitors from far and wide. The group of dinosaurs survived two major typhoons this year thanks to the protection provided by buildings around the field. But the rice in the paddy is getting close to harvest, so those wishing to see the special art should head over before the middle of November. With Halloween right around the corner, businesses from a Kaohsiung shopping mall today collaborated to bring the “Mad Tea-Party” from Alice in Wonderland to life, inviting kids and parents to dress up for an outdoor costume party. They’re planning an even bigger event for Sunday, with 500 families expected to take to the streets for some leisurely trick-or-treating.